I like August. And not just because it signals the start of another football season. It’s also the time of year when I have enough holiday to combine a game of football with an unfeasibly long train trip. It’s a train trip that starts in the depressingly anodyne surrounding of Milton Keynes, home of franchise football, and ends 23 hours later with me emerging blearly-eyed out of the U-Bahn and onto the Heiligengeistfeld (literally, the field of the Holy Spirit), home of the Hamburger Dom and FC Sankt Pauli. From the ridiculous to the sublime via, London, Brussels and Köln. This is the fifth season in a row that I’ve participated in my own little InterRail adventure (my other half thinks I’m compensating for missing out in my youth – I stayed home, a shy, nervous teenager, terrified at the prospect of ‘sleeping rough’ on train platforms across Europe whilst my mates partied to non-stop Euro-techno. To complete the melancholy picture, I’m pretty sure I spent the entire summer listening to The Smiths - There Is a Light That Never Goes Out. #youthwastedontheyoung etc,.) 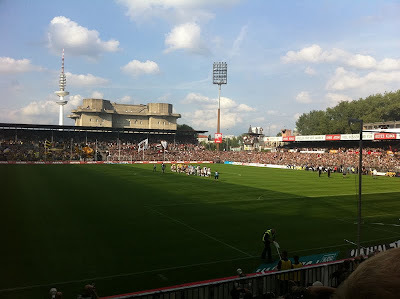 It is also my fifth season watching St Pauli and nearly four years to the day since I first made the trip to the Millerntor to watch the season opener. Although, watching the first home game this year, was a feat only made possible by the idiocy of some bloke throwing a beer cup at a linesman (at the end of the home fixture against Schalke in April) and the general ineptitude of the German football authorities who decided to punish the unruly pupil with a class detention, moving St Pauli’s first ‘home’ game of the season 60 kilometres north, to VfB Lübeck’s Lohmühle Stadium. 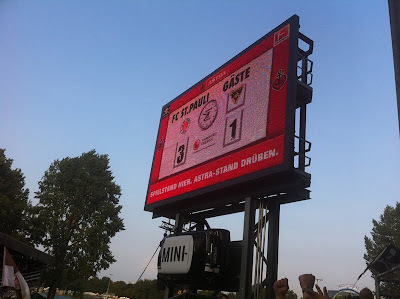 The 2011/12 season had kicked-off unfeasibly early on the 15th of July – before the kids had even broken up for summer! So, the all-round stupidity and repercussions of the beer throwing had done me something of a backhanded favour – it had kept my first home game tradition alive. I was here this time last year as well, and witnessed a 0-1 defeat at the hands of TSG 1899 Hoffenheim (SAP 1899 Hoffenheim, anyone?) with the Boys in Brown falling to one of those crushingly depressing late goals that would prove to be our undoing on numerous occasions. Hoffenheim was our first home fixture back in the big time of the Bundesliga. Our last was an embarrassing 1-8 tonking at the hands of Bayern Munich. 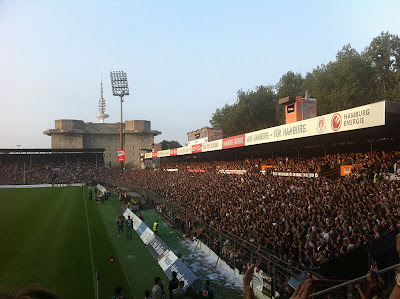 Much changed over the course of that season both on-and-off the pitch, so my trip was a good opportunity to take stock of the lasting impact of a season in German top-flight on the heart, soul and spirit of St Pauli. 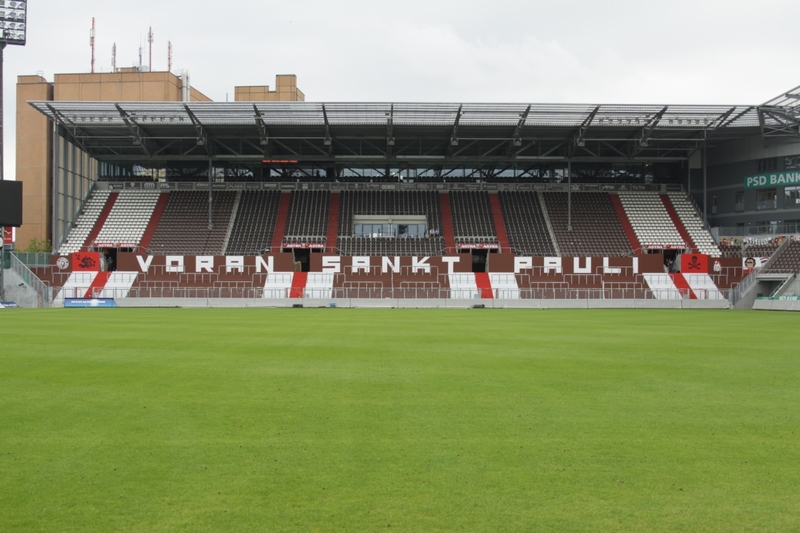 One of the constant themes that underpinned last season was the worry that St Pauli – the football club and the district – was changing. And not for the better. The district is at risk of creeping gentrification and rising rents are forcing people out. Urban redevelopment is not confined to the mammoth HafenCity project, St Pauli too is fast becoming desirable real-estate. Meanwhile, in football the rampant commercialization that sours the game at the top-level in England was becoming more noticeable in Germany too. This has put pressure on St Pauli’s core fanbase. 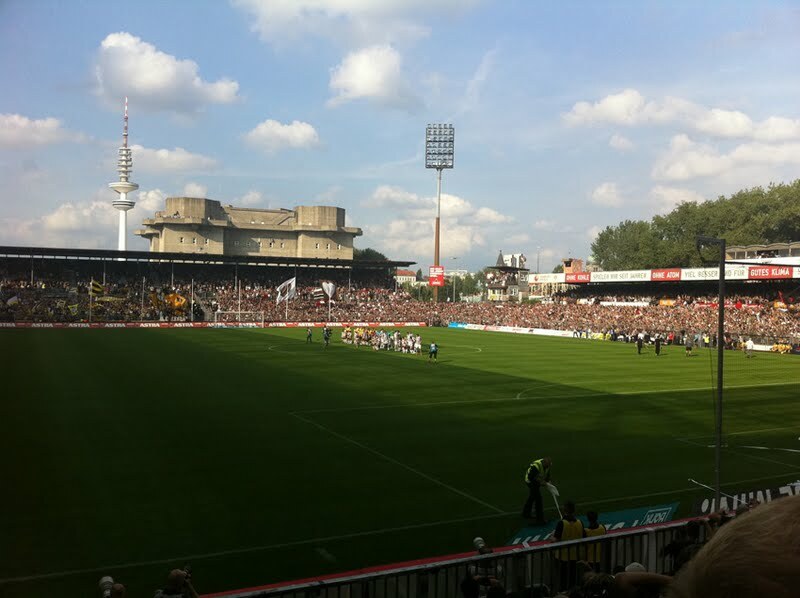 A shiny, modern stand packed with business seats and executive boxes had replaced the old Haupttribüne and caused divisions among the traditional supporters and the newer ‘mode’ fans. This culminated with the inspired ‘Jolly Rouge’ campaign that turned the Millerntor into a sea of red flags for the home game against SC Freiburg. The Jolly Rouge (a red flag with a black skull and crossbones flown by pirates indicating they were in the mood to take ‘no prisoners’) was a clever appropriation of the highly branded ‘official’ Jolly Roger used by the club. The campaign went someway to repairing the divisions between different sets of fans, and between the fans and the club itself – an uneasy truce, if you will. Of course, I missed all of this, watching from afar on the internet, so I was interested to see what the atmosphere would be like as the new season got underway. I arrived in Hamburg just after lunch, literally dodged some very drunk Aachen fans who fell over in front of me, shouting something incomprehensible in my direction, and stretched my legs by wandering around the stadium taking pictures of some of the bits of street art and graffiti that help make the area around the stadium so special. With the stadium empty, the contrast between the two new stands and the two surviving older stands couldn’t be more marked (although the Ultras have done their bit to pimp up the Südkurve over the summer by painting the terracing, and I must say it looks splendid.) That said, if I could wave a magic wand and change anything, it would be to halt the redevelopment right there. 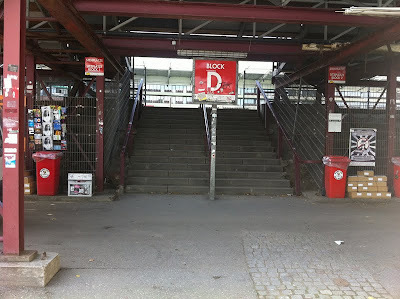 The awkward tangle of concrete and scaffolding that is the Gegengerade should be preserved for all eternity, to me it represents so many of the things I treasure about St Pauli –ramshackle, yet soulful. I also got to see up close, the Mad Max post-apocalypse executive box that had sprung up between the Gegengerade and the Nordkurve. The boys over at The Football Ramble couldn’t get enough its ‘sausage train’ that delivers beer and sausages to guests in their seats, and I agree it’s a great concept and the box does look very ‘St Pauli’ but there’s always that nagging doubt that it’s actually, well, a bit pastiche. Anyhow, I got some snaps, just in case the Gegengerade is gone by the time of my next visit. Finally, it was time to head onto the Südkurve, which with 40 minutes to go until kick-off was already pretty full. The sun was out, the fans were in good voice and Hells Bells still sent a shiver down my spine – things were looking good. Fans on all sides of the stadium were loud, driven on by the Südkurve’s call & response chanting, the atmosphere was just as incredible as I remember it. The match itself was an error prone shocker, but a goal right on full-time gave St Pauli a 3-1 win, their first ‘home’ victory at the Millerntor since February 2011. The place went mental and I got soaked in the ‘traditional’ beer shower. 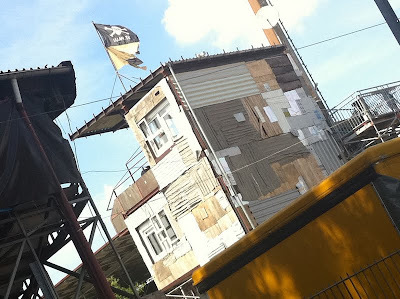 Any lingering doubts about St Pauli’s status as something different had been banished. It had been the usual inspiring, invigorating, beer soaked trip. My sanity is regularly questioned for spending nearly 24 hours on trains just to watch 90 minutes of football (and it’s true, I could fly.) But it’s not really the football I go for. It’s the fans, and the atmosphere they continue to generate. It’s about having a beer with like-minded folk; chatting with people who have been going to the Millerntor from the UK for over 25 years – and have seen real changes yet still keep coming back; about meeting members of New York City’s East River Pirates fan club watching a rare live game, soaking up memories to see them through the countless matches they watch on tape-delay in the Big Apple. This, to me, is what makes the FC St Pauli community special. I just had the trip to do in reverse now, but I was bolstered by a great day on the Heiligengeistfeld and had taken on supplies for the journey home: I’d managed to acquire, not only the 11 Freunde new season guide, but also a glossy guide to French football and a handful of Cadbury’s playfully named Wunderbar, err, chocolate bars to see me home. Heady days indeed. I left Hamburg station at 9.00pm reassured that the spirit of football was very much alive, and I returned to Milton Keynes Central 16 hours later, to a timely tweet from a certain Andy Brassell (occasionally of this Parish) alerting me to the fact that AFC Wimbledon were just about to make their Football League return. Perfectly timed proof that English football has a soul too, despite the best efforts of those that govern the game. 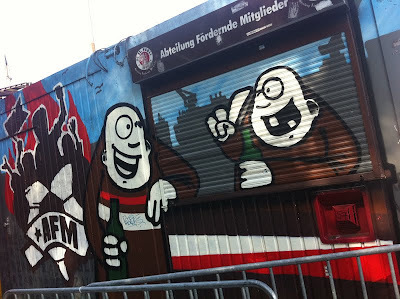 FC St Pauli isn’t perfect, it doesn’t exist in a commercial-free, ideological bubble, and I know it’s a bit of a (social) romantic cliché but it is still the closest thing I found to the very heart, soul and spirit of football. I love it there – it feels like home. Note: Danny, do I win some sort of large cash prize for writing a whole piece on St Pauli and not once mentioning the Reeperbahn, punks or prostitutes? If I do I’ll put it all towards my next Euro adventure, promise! (I'm afraid not old chap, but I've got the EFW parcel dispatch team to mail you out a box full of Wunderbar, possibly - Ed. ).